When we hold onto resentments we are holding on to negative emotional blocks. Holding onto negativity is counter-productive to leading a happy, calm, conflict free, positive life. Negativity is draining. Imagine you are holding all your resentments in a bag. How large would it be? Do you really want to continue carrying it? 2 Next look again at each resentment and ask whether you had any control of the circumstances. When things happen out of our control we feel powerless because in fact we had no power over the situation itself. However we do have power over our responses. So if for example your life becomes affected by an unforeseen event or an act by another person look at your thinking around this. Its quite natural and normal to feel disappointed, angry, hurt, upset by the behaviour of others. However when you hold onto it you are giving a lot of power over to others. Try instead to see the action or behaviour as belonging to them (not you) and ask yourself whether you want to continue to feel bad because of someone else. Try not to judge others but instead try and put yourself in their shoes andtry to understand and forgive them. 3 If you are resentful about society’s wrongs or events out of your control do something positive with your feelings. Join a group, political party or volunteer in a positive way. Turn negative into positive and see how much better you will feel. If you see yourself as a victim you will be one. If you see yourself as a positive agent for change you will be one. Make the Choice! 4 Look again at each resentment in turn. Ask yourself “what was my part in this situation”. This step is about taking responsibility for your own actions or inactions. Write down your part against each resentment and think about what you can learn for the future. 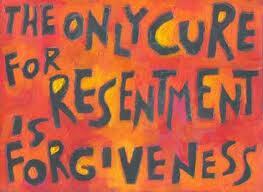 5 Think about how you have allowed each resentment to affect you. Think about the extent to which it has affected you and ask yourself how much longer you would like it to affect you. Perhaps another week, month, six months, year or the next ten years. Begin to see now the power you have over your own life. 6 Think about unfinished business on the list. If there are resentments on your list which still need to be resolved then look at who you need to speak to in order to do this. Start to think about communicating your thoughts and feelings with the other party/parties. 7 If you are unable to speak face to face or you feel you cannot face the other person for whatever reason write a letter (that will never be sent) – the purpose of this is to release all of your thoughts and feelings onto paper, or do this on the computer. The reason for not sending it is to free you up to be as open as you want to be. Don’t hold back in this letter. Say it how it is. You are not going to send it. Repeat this exercise every day for a week. 11 Maintaining communication is key to keeping a happy relationship. It will enable trust and respect to grow between you and this will allow you all to feel safe in speaking your truths. Make time to see or speak to those that are important to you. We all have busy lives but the importance of partners, family and friends can never be over-stated. 12 Accountability and responsibility. Be 100% accountable for your actions and 100% responsible for your own communication and 100% responsible for listening to the communication of others. Be straight with people, honest and true to yourself. Be happy.